Jazz music is appreciated worldwide. If you are ever traveling and are new to some countries, here are where some of the best jazz clubs are located so that every place you go will be just like home. In Westminster, you can go to the Java Jazz Café & Bistro. Live jazz is played served with Filipino cooking, with dishes like kare-kare, milkfish and bangus. Every night there are different artists playing. Times are from Tuesday-Thursday from 12p.m. to 2:30p.m. and 5:30 to 12:00a.m. Friday it’s to 1:00a.m., Saturday 3 p.m. to 1 a.m. and Sunday 5:30 p.m. to midnight. If you want to attend jam sessions, they are each Saturday 3p.m. to 6p.m. If you are ever in Victoria, go to the Hermann’s Jazz Club on 753 View Street. This club has been around for 25 years. You can enjoy good food and international jazz music from the hottest musicians around. In Vancouver, you can go to Capones Restaurant & Live Jazz Club. 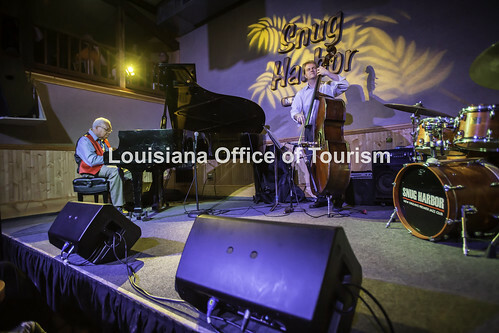 Jazz music is played there every night of the week. The food is excellent food and wine. Some of the dishes are pizzas, pastas, tapas and there are also some signature entrees. The musicians that play here are literally chosen to play there from the area and offer great west coast jazz music and blues. You have to call and book in advance to get a table here. If you are heading to Havana, be sure to stop at La Zorra Y La Cueva Jazz Club. Open every day, you can eat, drink, dance and enjoy the best jazz music as only the best of musicians play here. Dress tropical for this club. In Bejing, you can go to The Big Easy. Modern jazz music and blues is played there. Ted’s Café plays traditional jazz on Saturday nights. In Shanghai you can go to the CJW. The CJW is the Cigar Jazz Wine House. It is on the highest floor of the fifty-story Bund Centre. The atmosphere is very modern, eccentric with lava lamps, transparent beaded curtains. The food is traditional western and Chinese fusion. In Binyamina, you can go to the milestone. The Milestone is set in a beautiful park inside a Roman fortress. The times are from weekends Thursday to Saturday. The jazz music is played by the best Israeli jazz musicians. Gourmet food is served, and there is also an amphitheatre. If you are in Haifa, go to the Hottentot. Performances are just about every single day. The atmosphere is laid-back, there’s good food, drinks and a gallery. I had to save the best clubs for last. French jazz clubs. The French are serious when it comes to jazz music. All kinds of jazz music is played from standard to amateur. There are many, many jazz clubs here. Quite a few American jazz musicians chose to live there permanently or temporarily and have enhanced their lives all around. Here is a couple of the best jazz clubs in France. In Paris 4th, there is Franc Pinot. Those that love swing and bebop music should come here. This club has natural acoustics, and is located in the heart of Paris. Times are from 7p.m. to 9p.m., but it depends on who is playing for the night. In the 15th, there is Jazz Club Lionel Hampton where the best bands and artists play contemporary jazz. If you want to enrich your spirit, go travel to other places to appreciate jazz music.